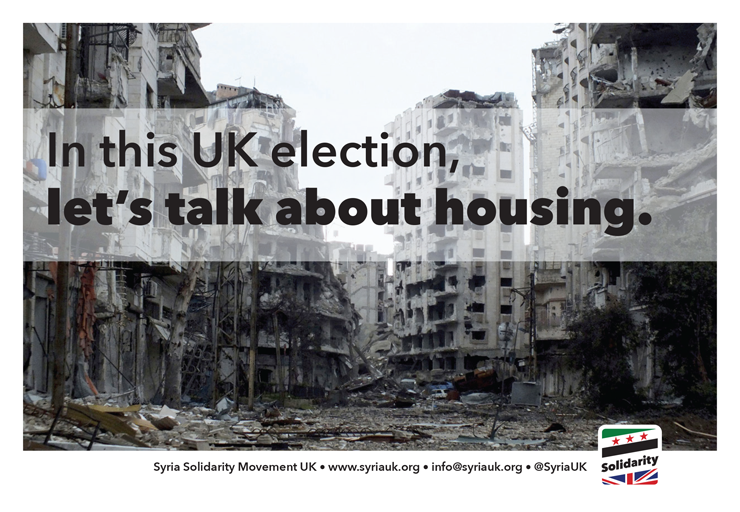 Syria Solidarity UK: In this UK election, let’s talk about housing. Damaged buildings in Jouret al-Shayah, Homs, Syria, on February 2, 2013. Photo by Yazen Homsy/Reuters. The city of Homs, pictured above, has seen some of the worst physical destruction of the past four years, but it is not alone. A March 2015 UN report used satellite imagery to record tens of thousands of homes damaged or destroyed across Syria. Some were hit by shelling or air attacks, others were levelled when the Assad regime demolished entire neighbourhoods considered sympathetic to the opposition. As thousands of families were driven from their homes, satellite photos also recorded the growth of refugee camps in surrounding countries. Mass graves of many of those who didn’t escape were also recorded in satellite images. Full report: Four Years of Human Suffering: The Syria conflict as observed through satellite imagery (PDF) By UNITAR/UNOSAT, March 2015. Report excerpts: A bird’s-eye view of war-torn Syria, Washington Post, 20 March 2015. Over half of Syria’s population have been displaced. Over 4 million refugees have fled the country, over 3.9 million of them to neighbouring countries. In the space of a year, Zaatari camp in Jordan became the world’s second largest refugee camp and Jordan’s fourth largest city. The number of Syrian refugees in Lebanon is equal to at least a quarter of Lebanon’s population prior to the crisis. António Guterres, United Nations High Commissioner for Refugees, says one-tenth of Syrian refugees require resettlement, but for now UNHCR have called on governments to provide places for 130,000 of the most vulnerable people. To date less than 85,000 resettlement places have been confirmed. Norway has pledged to resettle 2,500, Sweden 2,700, and Germany has pledged places for 30,000. The UK resettled just 143 people up to February of this year.